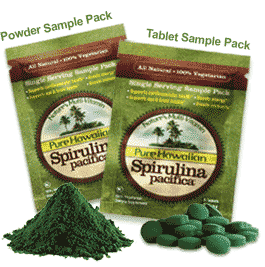 Click here to visit the Hawaiian Spirulina site and fill out the form to request a free sample of their Hawaiian Spirulina Superfood. Your free samples should arrive within 4-6 weeks by mail. *In case you’re wondering, according to their site this is supposed to “boost immunity and energy / promote health and longevity.